A couple of weeks ago, I started experiencing a bit of recurring pain in the right forearm. I put it down to a few heavy sessions of MiniMetro, a game where you have to constantly drag & drop between points on the screen; the Magic Trackpad, even rotated in a negative-slope position, was forcing my arm and wrist to do too much work. 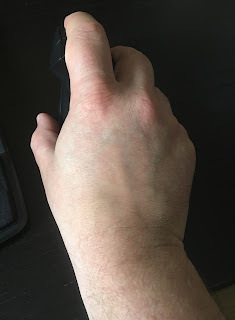 After a bit of googling, I decided to try a vertical mouse, which should (in theory) keep your arm in a more natural position, and actually move a lot of work from wrist and forearm muscles towards the shoulder and upper arm muscles. The market for ergonomic devices has always been small, but there's a surprisingly wide choice of vertical mice out there. Unfortunately, a lot of them don't inspire much confidence; some are sold as vertical but actually end up being just fancy-shaped regular mice. The best in class seem to be Evoluent products, which are really vertical and really ergonomic but also really expensive. I wasn't ready to drop almost £100 on something I might not like, so I steered towards cheaper alternatives. Some of the best reviews on the net pointed towards this fin-shaped CSL wireless mouse, and it was so inexpensive that it wouldn't feel like a waste if I ended up not liking it. The shape makes a bit more sense when you see the SHARKK-branded version - fins, sharks... I honestly don't know which brand came first or which one is more reliable; SHARKK is a US company whereas CSL seems to be based in Germany, but both have a history of distributing and rebranding products by Asian manufacturers, so the original factory is probably the same Shenzhen hangout. The most annoying element of this mouse is the fact that it does not use Bluetooth, but rather a bog-standard USB wifi dongle. In recent Macs, USB ports are very few and losing one forever is a Big Deal. The mouse does not require drivers, which is great news for Mac users. It simply appears as a regular HID with 5 buttons: left, right, middle (under the wheel), and two near the thumb. 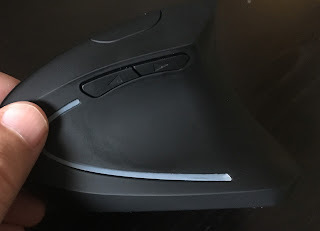 A sixth button, on top of the fin, is actually the DPI selector, which allows you to change resolution (and hence sensitivity) between three modes: 800, 1200 and 1600 DPI. The selector works fine (just cycles through modes as you click it, with no feedback on screen) but OSX just doesn't "see it" as a regular button, which means you cannot easily re-purpose it once you've set the DPI mode. How often will you need to change mouse sensitivity? An operation so rarely performed doesn't really deserve a large button in such a prime location, but there you go. The two thumb buttons are supposed to be for browser Back/Forward, but with Firefox they actually trigger the infamous "hold and scroll" widget, so I used BetterTouchTool to remap them with trackpad gestures I used the most (Mission Control to switch between windows across all apps, and Application Exposé to switch between application-specific windows). I also set middle-click to Launchpad. A little quirk: the mouse built-in powersave settings will switch off the mouse if you don't use it for a few minutes; often you will have to click it or shake it to wake it up. There is no way to disable this behaviour under Mac. It obviously takes a bit of time to adapt to the vertical position. Movements that would rely on the wrist with a trackpad or horizontal mouse, now require better coordination further up the arm. Wrist movements are set on a different axis (up-down, rather than sideways), but to be honest it's probably best to keep them at a minimum, relying on your arm instead. After a few days of use, the pain seems to have gone, which is great news. However, I'm not totally convinced about this mouse. It does take some conscious effort to keep my hand in the vertical position, being way too easy to absent-mindedly slip back into a traditional posture; the fin shape will not stop you from doing it. That's probably the reason Evoluent models have steeper shapes. Correct position, with vertical wrist. 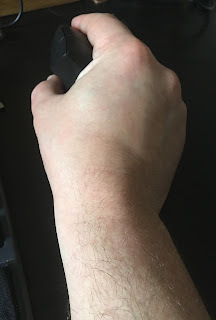 My hand as a whole also does not feel more relaxed, and the mouse/keyboard switch now seems a bit more tiring, since I have to actually rotate the forearm; I guess I could address that by sloping my keyboard, something I've resisted until now. Still, it's a bit annoying. 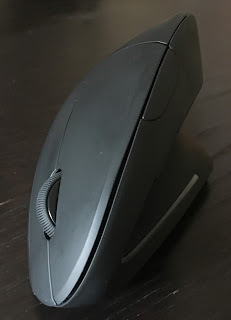 In conclusion, the CSL vertical mouse is great value for money: solid build, works flawlessly, cheap as chips. Is it a great vertical mouse though? I'm not so sure. Will I switch to vertical mice for good? Probably not, at this time and with this mouse, but I will revisit this position in a month or two.